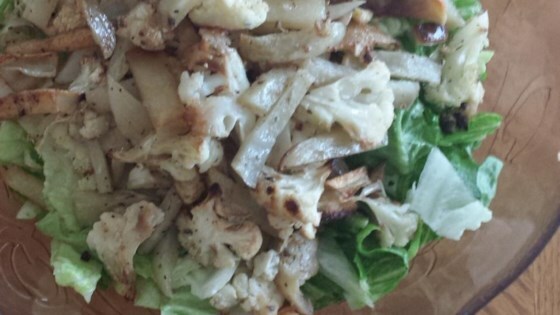 "Fried cauliflower tossed with tahini dressing gives this salad the unique taste of the Middle East." Deep fry the potato sticks until crispy and golden brown, about 4 minutes. Remove, and drain on a paper towel-lined plate. Deep fry the florets in two batches until golden brown; drain on paper towels. Allow the cauliflower to cool until it's just warm. Stir together tahini and olive oil in a large bowl until smooth. Mix in yogurt, lemon juice, vinegar, cumin, salt, and pepper. Add cauliflower, arugula, and lettuce; toss to coat with the dressing. Place salad onto serving plates, and sprinkle with the potato sticks. Try this quick cooking fried 'rice' that actually has no rice at all! I roasted the cauliflower and potato in the broiler rather than frying it. Garnished with black sesame seeds. Good, but probably not something I'd make again.